At a constant altitude, during a coordinated turn in any aircraft, the load factor is the result of two forces: centrifugal force and weight. [Figure 5-52] For any given bank angle, the ROT varies with the airspeed—the higher the speed, the slower the ROT. This compensates for added centrifugal force, allowing the load factor to remain the same. Figure 5-52. Two forces cause load factor during turns. Figure 5-53 reveals an important fact about turns—the load factor increases at a terrific rate after a bank has reached 45° or 50°. The load factor for any aircraft in a coordinated level turn at 60° bank is 2 Gs. The load factor in an 80° bank is 5.76 Gs. The wing must produce lift equal to these load factors if altitude is to be maintained. Figure 5-53. 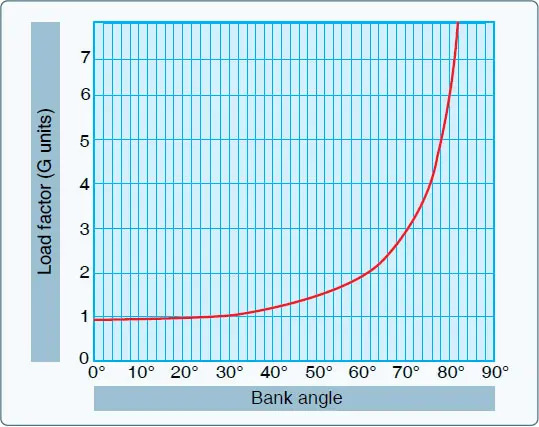 Angle of bank changes load factor in level flight. It should be noted how rapidly the line denoting load factor rises as it approaches the 90° bank line, which it never quite reaches because a 90° banked, constant altitude turn is not mathematically possible. An aircraft may be banked to 90° in a coordinated turn if not trying to hold altitude. An aircraft that can be held in a 90° banked slipping turn is capable of straight knife-edged flight. At slightly more than 80°, the load factor exceeds the limit of 6 Gs, the limit load factor of an acrobatic aircraft. Any aircraft, within the limits of its structure, may be stalled at any airspeed. When a sufficiently high AOA is imposed, the smooth flow of air over an airfoil breaks up and separates, producing an abrupt change of flight characteristics and a sudden loss of lift, which results in a stall. When intentionally stalling an aircraft above its design maneuvering speed, a tremendous load factor is imposed. 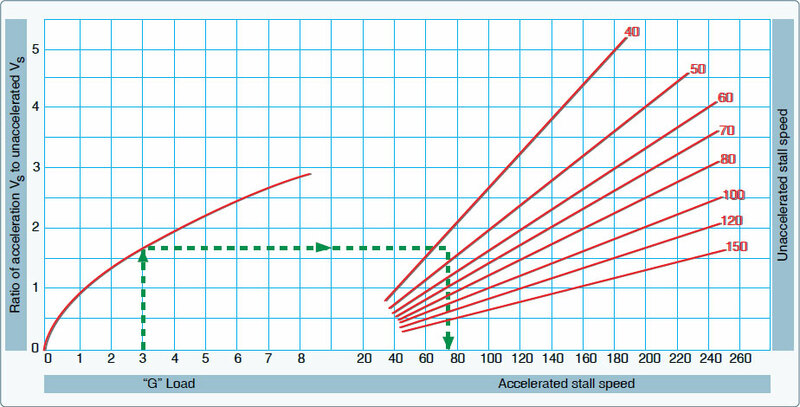 Figures 5-53 and 5-54 show that banking an aircraft greater than 72° in a steep turn produces a load factor of 3, and the stalling speed is increased significantly. If this turn is made in an aircraft with a normal unaccelerated stalling speed of 45 knots, the airspeed must be kept greater than 75 knots to prevent inducing a stall. A similar effect is experienced in a quick pull up or any maneuver producing load factors above 1 G. This sudden, unexpected loss of control, particularly in a steep turn or abrupt application of the back elevator control near the ground, has caused many accidents. 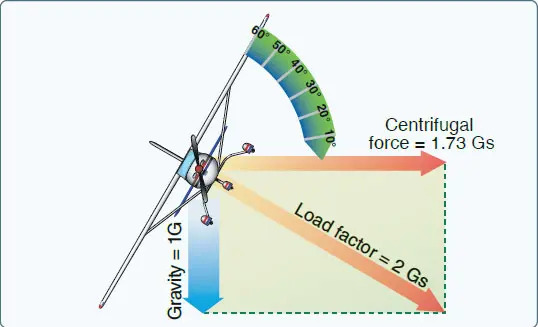 Since the load factor is squared as the stalling speed doubles, tremendous loads may be imposed on structures by stalling an aircraft at relatively high airspeeds. The following information primarily applies to fixed-wing airplanes. The maximum speed at which an airplane may be stalled safely is now determined for all new designs. This speed is called the “design maneuvering speed” (VA), which is the speed below which you can move a single flight control, one time, to its full deflection, for one axis of airplane rotation only (pitch, roll or yaw), in smooth air, without risk of damage to the airplane. VA must be entered in the FAA-approved Airplane Flight Manual/ Pilot’s Operating Handbook (AFM/POH) of all recently designed airplanes. For older general aviation airplanes, this speed is approximately 1.7 times the normal stalling speed. Thus, an older airplane that normally stalls at 60 knots must never be stalled at above 102 knots (60 knots × 1.7 = 102 knots). An airplane with a normal stalling speed of 60 knots stalled at 102 knots undergoes a load factor equal to the square of the increase in speed, or 2.89 Gs (1.7 × 1.7 = 2.89 Gs). (The above figures are approximations to be considered as a guide, and are not the exact answers to any set of problems. The design maneuvering speed should be determined from the particular airplane’s operating limitations provided by the manufacturer.) Operating at or below design maneuvering speed does not provide structural protection against multiple full control inputs in one axis or full control inputs in more than one axis at the same time. Since the leverage in the control system varies with different aircraft (some types employ “balanced” control surfaces while others do not), the pressure exerted by the pilot on the controls cannot be accepted as an index of the load factors produced in different aircraft. In most cases, load factors can be judged by the experienced pilot from the feel of seat pressure. Load factors can also be measured by an instrument called an “accelerometer,” but this instrument is not common in general aviation training aircraft. The development of the ability to judge load factors from the feel of their effect on the body is important. A knowledge of these principles is essential to the development of the ability to estimate load factors.